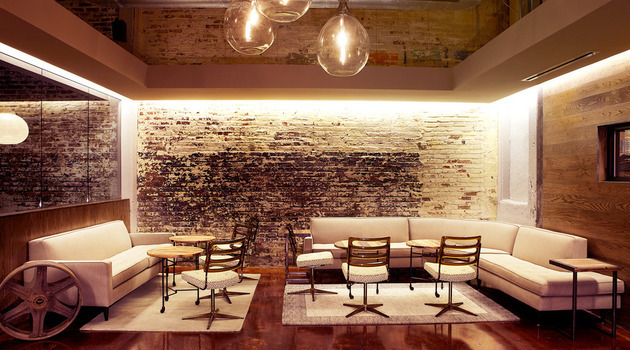 Did you know some of the best restaurant designs intend to go unnoticed? It’s true. All restaurants have eye-catching components like a cool mural or a quirky bathroom, but those are not as important as the layout, the lighting, and the carefully cultivated mood. At Sensory Six, we strongly believe that the spaces we create should be in harmony with all one’s senses, thus creating a total sensory experience. A well-designed restaurant will not distract customers from the food, and especially not from the conversation. Instead, it will subtly contribute to one of those memorable evenings when everything clicks: the meal, the service and the warm vibes. In this blog, we review are a few different approaches to creating a successful design space, and the trends that are important in creating a sensory experience in restaurants. Before jumping right into what the latest restaurant design trends are, it may be helpful to look back on how things have been designed in the past and how they might be designed moving forward. A while back, customers didn’t mind a little rubble in the restaurants they dined at. For instance, let’s say you are at a bistro in Paris with slightly damaged marble tops, stains and a pitted surface. What does this mean for the restaurant? Yes, it’s doesn’t seem like it is in the best shape, but it also doesn’t make the restaurant old. This kind of stuff gives restaurants history and character that customers value. Today, customers have become very community-minded. It’s especially important that your restaurant design reflects the community and neighborhood in which they serve. People are more likely to dine at a restaurant that promotes interaction with one another. Fast forward 10 years from now… Nobody knows what the future will hold for restaurant design. However, a young line cook might gain a few tricks up their sleeves on how to pinpoint a successful design compared to a failed design. A person’s first place is always the most special and rewarding project to work on. That’s why at Sensory Six we keep up with latest trends, both new and old, that will help our clients create the most functional, effective and appealing restaurant. When designing a restaurant, it’s important to consider the practicality of the restaurant flow, meaning the path to from the kitchen never crosses the path to the bathroom, and server stations are concealed within the dining room. Concentrating on pathways and sightlines rather than chairs, doors and murals helps to ensure that the restaurant flow is efficient, providing a better overall experience for diners. 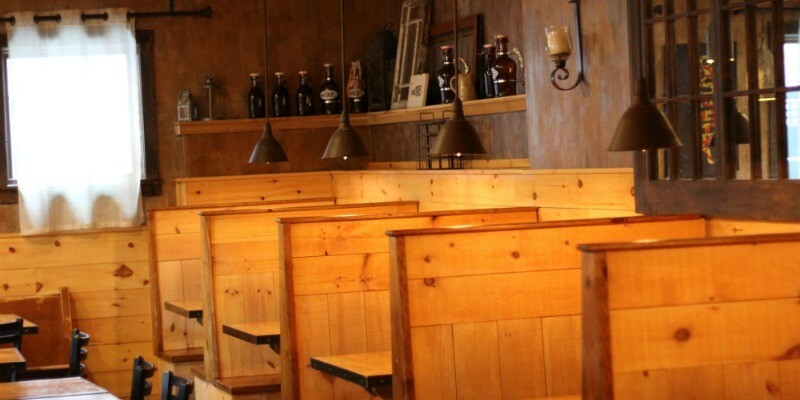 The process of designing a restaurant space goes far beyond considering the practicality and functionality. At Sensory Six, we also spend a great deal of time considering each diner’s visual experience. Heavy industrial design has been done for the past 5 to 7 years, and now, people are craving simpler spaces when it comes to restaurant designs. Lighting design is an important element to creating a “simpler space”, and the trick to good restaurant lighting design is having light wash over a space but not being able to pinpoint the source of the light. 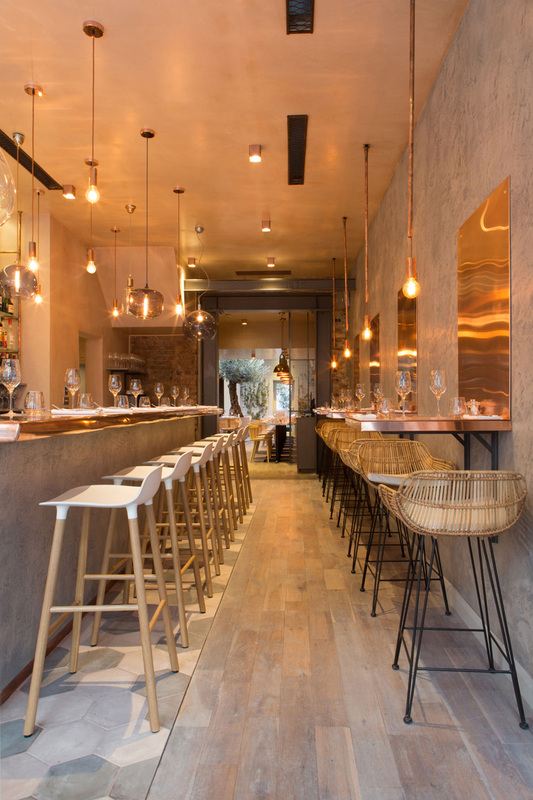 Before finalizing the design of any restaurant space, it’s important to sit in every seat and ensure that each diner’s visual experience is perfect. Restaurant design is becoming less symmetrical and less regulated. Using materials, we can evoke a concept or place through materiality. I.e., the coldness of metal, the warmth of wood. Incorporating unique, or even hand-made pieces tend to spark something within a diner that forces them to feel something. Customers want a dining affair that does more than just appeal to their taste buds. They want an experience of escape, comfort and indulgence. The team at Sensory Six loves working with restaurants to create a truly unique space that draws in the crowds. 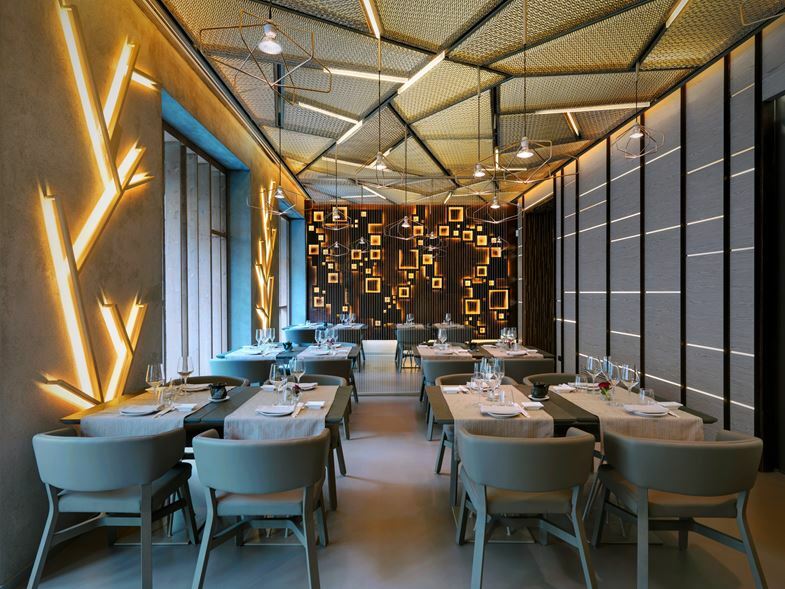 Accomplishing a total sensory experience requires carefully selected elements such as lighting, texture, color and acoustics that complement the overall brand of the restaurant. These features can create a beautiful ambiance that stimulate the senses, giving guests more to remember than just the food. For information on how we can create a sensory experience for your restaurant, contact us at Info@SensorySix.com.